The use of coats of arms (stemmi in Italian) emerged in the 12th century as a way of identifying armoured knights in combat. The practice was then adopted by the nobility and by banking and merchant families. They placed them on the outside of buildings and on tombs as identifiers or signs of allegiance. Similar stemmi also appeared on livery and small-scale objects. 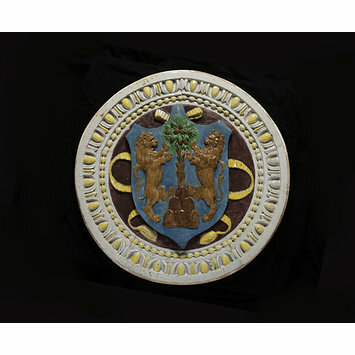 Circular relief in polychrome enamelled terracotta. 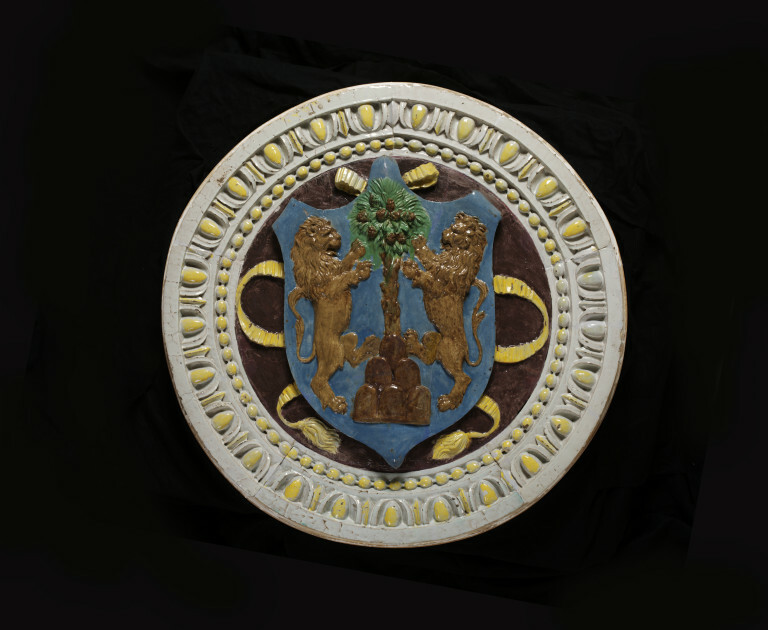 With a frame composed of white and yellow egg-and-dart and pearl mouldings, on a porphyry ground, is a Tuscan shield with the Becchi-Fibbiai arms (azure, a pine tree on a mount of six summits accompanied by two lions affronty, all proper), The summits and tree trunk are enamelled in brown, the foliage in green, and the lions in brownish yellow. The surface of the shield is blue, and the ribbons behind are yellow. Maclagan, Eric and Longhurst, Margaret H. Catalogue of Italian Sculpture. Text. London: Victoria and Albert Museum, 1932, p. 85. Inventory of Art Objects Acquired in the Year 1858. In: Inventory of the Objects in the Art Division of the Museum at South Kensington, Arranged According to the Dates of their Acquisition. Vol I. London: Printed by George E. Eyre and William Spottiswoode for H.M.S.O., 1868, p. 8. Pope-Hennessy, John. Catalogue of Italian Sculpture in the Victoria and Albert Museum. Volume I: Text. Eighth to Fifteenth Century. London: Her Majesty's Stationery Office, 1964, p. 249.